Robert D. Glatter, MD: Good afternoon. My name is Dr Robert Glatter. I am an attending physician in the Department of Emergency Medicine at Lenox Hill Hospital in New York City and a member of the Medscape Emergency Medicine Editorial Board. I am talking today with Dr Tom Frieden, director of the US Centers for Disease Control and Prevention. We're here to discuss the recently released national action plan for combating antibiotic-resistant bacteria and some of the real-world challenges we face as practicing clinicians. The plan covers a lot of ground. One big area for clinicians is the difficulty in quickly deciding whether an antibiotic is warranted. A Medscape/WebMD survey found that roughly 1 in 5 antibiotic prescriptions are written when the prescriber is not sure that the drug is truly needed. This number actually increased to 1 in 4 in the emergency setting. One of the key goals of the new plan focuses on the development and use of rapid and innovative diagnostic tests to alleviate some of the clinical uncertainty. So, Dr Frieden, can you talk about some of these rapid diagnostics, the current research, the timeframes, and what clinicians might expect? Tom Frieden, MD, MPH: They are a ways off. We do not yet have rapid diagnostics, but they are getting closer. We have the rapid strep test and that's important, but we also have the best rapid test available: the patient history. Far too many antibiotics are being given for conditions for which they are really not indicated. This includes most otitis media and most bronchitis without fever and without other complications. We find that between a third and a half of all antibiotics used in this country are either unnecessary or overly broad-spectrum. Dr Glatter: Is there a way that we can try to engage the patient in some fashion to try to understand their point of view and then do the right thing? Dr Frieden: One of the things that is becoming better understood as we move forward is that antibiotics are indeed miracle drugs, but they also have risks. Like with any medication, there are risks and benefits, and we need to balance those risks and benefits. We've seen C difficile which kills 15,000 Americans a year and is a result of antibiotic use. We've seen more than 20,000 Americans a year dying from drug-resistant infections. It used to be thought that there was kind of a friction between what's best for my patient and what's best for the community at large. Now it's clear that they are really the same thing: rational antibiotic use. Dr Glatter: How do we get the message out to people? How do we let the patients know that antibiotics aren't always necessary, and how will they feel comfortable with that? Dr Frieden: It's interesting; both patients and doctors may assume that the other wants an antibiotic. Patients may assume, "Well, I'm not really sick. He's not taking me seriously if he isn't giving me an antibiotic." The doctor may assume that the patient will be unsatisfied if they go away without an antibiotic. Part of that is increasing communication and saying, "We want what's best for you. We don't want the most medicine, we want the right medicine. We want medicine that's not going to make you sick and that will help you and not be unnecessary." Dr Glatter: I also want to focus on new point-of-care testing and how we can have rapid diagnostics and know whether it's a bacterial or a viral infection. Is there anything in the pipeline now within the next year or two where you could say, within an hour or even less, "This is a bacterial infection and I need an antibiotic" or "It's a viral infection and I don't"? 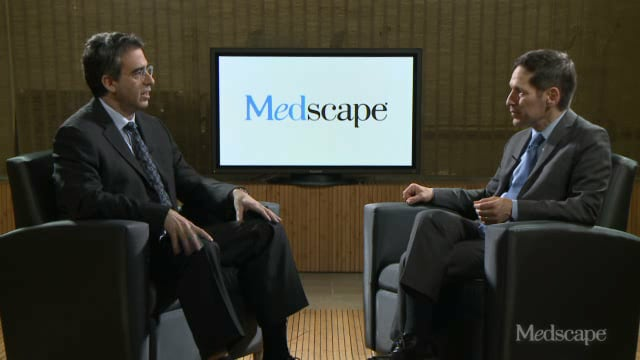 Dr Frieden: There are some new tests coming down the pike. There are some new companies providing integrated polymerase chain reaction (PCR) machines that may be able to give you a respiratory panel or an enteric panel. They're not there yet. Until they are there, we still have to be careful with antibiotics. We still have to reserve them for when they are really necessary. Dr Glatter: That's where the role of the clinician comes in. We have to be looking at situations and really using our rational judgment. Dr Frieden: Absolutely, because if we use antibiotics when they're not necessary, we may well not have them when they are most needed. Dr Glatter: One emergency physician actually summarized it like this (and I want to talk about how there is pressure on physicians to give a prescription, similar to what we are focusing on): "Physicians are more likely to take the easy way out and write the prescription than engage in the 15-minute conversation explaining why antibiotics aren't necessary for a viral infection." Do you want to respond to that? Dr Frieden: All too often we address symptoms rather than causes. If a patient has a problem, we need to discuss that problem with the patient and why antibiotics aren't necessary. That can be a particular challenge in a busy emergency department. Fundamentally, we want what's best for patients, and what's best doesn't mean the most medications. We're seeing a real increase in drug resistance and deadly C diff in the community. Dr Glatter: When doctors have their patients rate them, one of the concerns is that their satisfaction scores are what matter. [Some say that] if they don't give an antibiotic they are apt to have a lower satisfaction score. How would you respond to that? How can we reinforce the principles of antibiotic stewardship? Dr Frieden: The most satisfied patient is going to be a patient who the doctor communicates with openly and respectfully. I don't think giving a whole lot of prescriptions is necessarily the best route to upping your scores. It is unfortunately a route to getting drug resistance much more widespread in our society. Dr Glatter: The general advice that you would give to the practicing physician who faces this everyday reality—what would it be if you had to sum it up in just one or two points? Dr Frieden: Never forget that antibiotics have risks as well as benefits for your patients as well as for the community. Dr Glatter: Very good. Thank you. So many of Medscape's readers have had very serious concerns about antibiotics used in animals. They want to know more about the plan to eliminate medically important antibiotics in food-producing animals and are worried that the initiatives are too limited, voluntary, and will not be enforced. Any thoughts about how we are going to address this issue? [It is important] because, certainly in the food supply chain, the producers do use antibiotics, and that is a concern that we have as physicians. Dr Frieden: That's really an issue for the US Food and Drug Administration (FDA) as well as the Department of Agriculture and producers, but what the FDA is moving forward with is a plan to remove the indications for growth promotion from medically important antibiotics. That would mean that antibiotics would not be available for those purposes legally. Fundamentally, what we as doctors can do is make sure that use of antibiotics in human animals is rational. Dr Glatter: Would you say that there is some contribution, in other words, from the animal suppliers and from agriculture that leads to the problem of antibiotic resistance? Dr Frieden: We've certainly seen, with organisms such as Campylobacter jejuni and Salmonella, several species where use in animals seems to be associated with higher rates of drug resistance in animals and in people. Dr Glatter: Can you comment about ionophores or the role in inducing some of this resistance and contributing to the problem of resistance itself? Dr Frieden: Really our goal is for rational antibiotic use. For the animal world, we want to ensure that when an animal is ill, it is attended by a veterinarian and given medications that are specific for its problem. Dr Glatter: What is the overall plan to promote the development of new antibiotics, vaccines, and nontraditional therapeutics? Can you give us some examples? Dr Frieden: There are lots of things underway that are exciting. We've got some new vaccines that are being rolled out or investigated. An infection that doesn't happen is one that's not going to be resistant. Vaccines are a great tool. We've got some of the enteric therapies for C diff which may use nonantibiotic means to reconstitute the microbiome. That's an exciting development. There are some new antibiotics that are in process and may be available in a few years. Fundamentally, if we don't take better care of the antibiotics we have today, if we aren't better stewards of them, we may lose these antibiotics and the next ones that come along. Dr Glatter: Do you think that [education] is beginning in medical school curricula? Do you think that's something that's being done right now or needs to be done? Dr Frieden: We need to emphasize at all levels of medical training for doctors, for nurse practitioners, for physician assistants, and for patients that antibiotics have risks and benefits and they should only be used when the benefits are likely to outweigh the risks. Dr Glatter: Back to the issue of patient demand. What provisions are there in general for consumer education about antibiotic stewardship? Dr Frieden: We're providing more and more information on our website. We're working with hospitals around the United States so that they can track the use in their community, and with health departments so that they can get a better view of what's occurring. We worked with one of the companies that looks at data on antibiotic use around the country and we found striking variability. You're three times as likely to get an antibiotic in some states as you are in other states. The folks in those states with fewer antibiotic prescriptions aren't dropping dead from infections. Dr Glatter: Do you feel that there will be monitoring of physicians and all medical professionals on what they're writing, and that this will be monitored and reported back on some data form? That is another concern that physicians have. Dr Frieden: I think the best way to do this is for hospitals to look at all of the physicians and clinicians who are on staff and to compare their prescribing patterns. Not to report it to the state or the federal government, but to agree, as an institution, what should be their policies and then to determine whether those policies are being followed. Dr Glatter: Thank you, Dr Frieden, for your time today. Dr Frieden: Great to be with you. Cite this: Tom Frieden, Robert D. Glatter. CDC Head Answers Your Questions on Antibiotic Resistance - Medscape - May 14, 2015. Disclosure: Tom Frieden, MD, MPH, has disclosed no relevant financial relationships. Disclosure: Robert D. Glatter, MD, has disclosed no relevant financial relationships. Disclosure: Thomas R. Frieden, MD, MPH, has disclosed no relevant financial relationships.